It is nearly bed time, but I thought I would try and write a letter to you before I went to bed, so you must excuse its being badly written, and very short. We had a lovely time at the party dearie, but it would have been nicer if you had been there. Nellieitdid look so sweet in her little mol cap. Annie Stockton looked simply stunning. She had beads and jewels everywhere about her. She had her hair fixed quaintly and prettily. Her name was Pennelope Stuart, Katherine's was Martha Washington, Katherine Wyatt's was Betty Washington, Adeline was Peggy Shippan, Mary's was Lydia Le Baron, Louise's was Josline Page, Nellie's was Dorothy Manners, and mind was Nellie Custis. Katherine Wyatt had on a white siflk waist, tight fitting, that her great aunt wore at her wedding. Did you see Ed and Aunt Florence Wednesday. Wasn't it too bad that it was raining so hard in Boston during the Wedding? Aunt Margaret said that they recieved perfectly beautiful presents. Cousin Lucy and Mary sent them some beautiful forks. I am so glad that they could stop and see you and Mamma in PhiladelphiaI am goinging in to Philadelphia Saturday prehaps, because the screw of my plate has broken for the second time, and then I will come home with you, won't that be lovely?We have just begun the fourth book of Caesar, and simultaneous equations in Algebra. 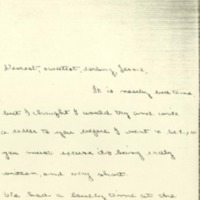 Wilson, Margaret Woodrow, 1886-1944, “Margaret Woodrow Wilson to Jessie Woodrow Wilson Sayre,” 1901 April 11, WWP17290, Jessie Wilson Sayre Correspondence, Woodrow Wilson Presidential Library & Museum, Staunton, Virginia.